2018 was a difficult year for investors, following a very strong year in 2017.2018 saw a considerable amount of political news, policy announcements and regulatory change. This has affected the business environment and the ability of many companies to make decent profits in the future. The resulting uncertainty has affected the willingness of investors to hold riskier assets. In 2018 the S&P 500 (the top 500 companies in the US) suffered the largest multiple contraction since 2002, while a broad range of global assets have failed to perform better than US inflation for the first time since 1992. Returns on individual client portfolios vary depending on their risk profile and the corresponding mix of funds. Typical returns in 2018 for Alchemi’s Medium Risk clients (i.e. 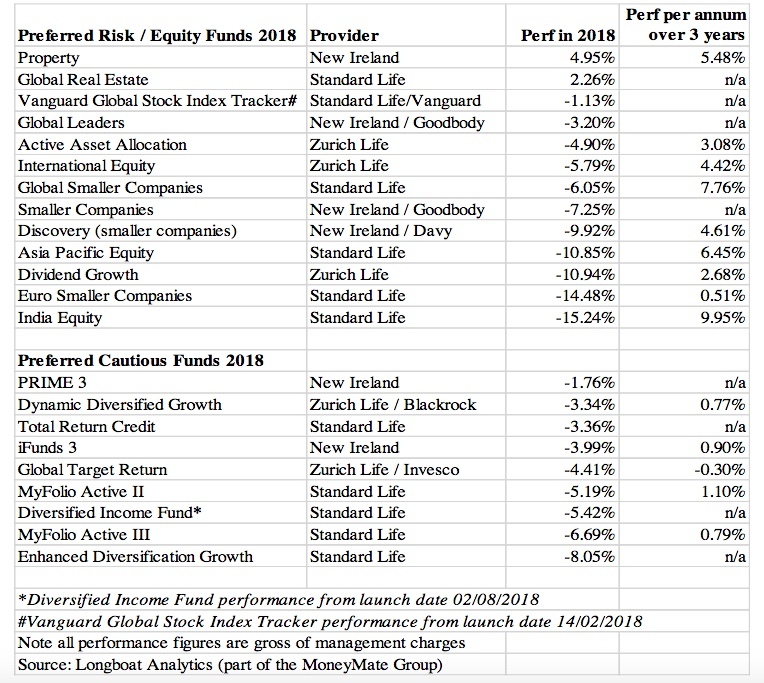 with 50% in Risk/Equity funds and 50% in Cautious funds) were circa -8% (compared to +15% in 2017).The performance of the average Managed Fund in Ireland in 2018was -5.2%.The best performing Managed fund in 2018was the Davy Asset Management fund which returned -2%.Source: -Rubicon Investment Consulting LtdThankfully, 2019 has got off to a good start, with most equity funds up by a few percent.The Standard Life Global Smaller Companies fund is up 4% and the Euro Smaller Companies fund is up 7%. The question on many investor’s minds is whether we are entering / have entered a bear market after 9 years of fantastic bull market returns. 9 years is a long time for markets to throw out significant positive returns, however markets can and have on several occasions continued for much longer. For example, from 1949 to 1972 (over 23 years) equities increased by 1758%. This was followed by a 39% correction over a period of 1 and a half years. And this was followed by a further increase of 1066% over a period of 13 years. Source: FinalytiQ Limited / Global Financial Date and Thomas, R and Dimsdale, N (2017) “A Millennium of UK Data”, Bank of England OBRA dataset. Corrections in equities range from circa 20% to 70%. The longest correction since World War II occurred after the Tech Bubble in 2000, whereby equities corrected by 53% over a period of 2 years and 7 months. The point is that while a major correction in markets/equities is possible, it is far from certain. Markets could well push on quite a bit further and even if there is a correction it is likely to be for a relatively short period and in turn followed by a significant uplift. It would be nice to be able to call the next correction but even if you got that right the chances of getting back into markets at the right time are almost impossible. Corporate and economic fundamentals support risk taking in 2019, as long as key policy errors are avoided, and preferably policy decisions support a recovery in economic momentum. 2)The ability of China and Europe to implement more successful stimulus to revive growth into 2019. Global economic growth was strong and uniform in 2017. But 2018 was very different with a divergence between US economic strength, weakening activity in China and stumbling performances in the Eurozone and Japan. It is important to put some of the recent weakness into context. The European economy has suffered from poor auto sales affected by one-off regulatory changes, while Japan was affected by a series of natural disasters. Sales and production are expected to recover into the spring as consumer spending remains supported by lower unemployment and higher wages. On the other hand, the extent of the slowdown in the Chinese economy in 2018 is important to highlight. Trade tariffs are only a minor explanation, with policy induced deleveraging within the shadow banking system playing a more significant part. 2019 is also set to be a divergent year as the US remains supported by fiscal stimulus. Yet the world economy as a whole appears to be stabilising due to slower growth, hampered by political uncertainty affecting business investment, and tariffs bearing down on global trade.2020 is forecast to be a complicated year. The US economy is set to slow sharply in response to a smaller fiscal stimulus. Recession risks are therefore relatively high over the next 24 months. Markets are intensely sensitive to US decisions on monetary policy.US rates have risen to 2% and are on course for 3%, although there have been some recent signals from the US Federal Reserve that they will tread carefully with future rate hikes.Further US-China tariffs are likely, but are likely to be relatively low asa percentage of total global trade.Monetary, fiscal, and regulatory initiatives in China are likely to stimulate its economy, especially key sectors such as consumption, autos and property.Fiscal policy in Europe is also likely to support markets.And the recent sharp fall back in oil prices should also provide support. We have spoken at length about global profits growth and the importance of this for risk investors. Global profits growth has been strong for some time and 5-10% global profits growth is expected in 2019.This is a key factor in supporting future equity market returns. These continue to be our preferred funds for risk investors, in particular the Standard Life smaller companies ’funds, where the process has been tried and tested over 21 years, during which 4 market/economic cycles have occurred.These fund managers are entirely focussed on identifying good companies, and are not focussed at all on external factors. They have an excellent track record in identifying really strong companies and holding them for relatively long periods to capture significant uplift in share values. For example, the Standard Life Global Smaller Companies fund, despite falling by circa 6% in 2018 has still returned circa 25% from 2016-2018 incl. We are very comfortable investing in these funds and we believe they have great potential to deliver strong returns in the future. The shift to online shopping is having a major impact on the property market. This is providing an opportunity in the ‘logistics’ space, for example large distribution warehouses being constructed on the outskirts of large cities.The population is declining in Europe overall, but rising significantly in many cities, resulting in an increase in demand for residential property in these cities.We are currently reviewing our preferred property funds to ensure that these opportunities are being captured. Following this review, we may be in touch to recommend fund switches. Economic growth is forecasted in 2019, albeit at a slower pace. Valuations and profits growth are attractive for equity assets. But investor uncertainty is likely to continue, and further market volatility during the year is therefore likely. Political risk remains high, however we believe that markets can cope with individual country issues, e.g. Brexit. Of far more concern is a major breakdown is US-China relations or renewed scepticism about the state of the European Union due to Italy’s budget problems. These three large economic blocs comprise almost 60% of global GDP, and the majority of marginal growth in the world economy. On balance we expect risk assets to perform well in 2019.